On August 23, 2012 the Space Coast Chapter of the Florida Public Relations Association (FPRA) installed its new board. The new board was installed during the Chapter’s Annual Roast & Toast event, which took place at Melbourne Hilton Rialto. The Roast and Toast event honored Rosalind Harvey of Canaveral Port Authority as PR Person of the Year and Vicky Peake of the Small Business Center at BCC. 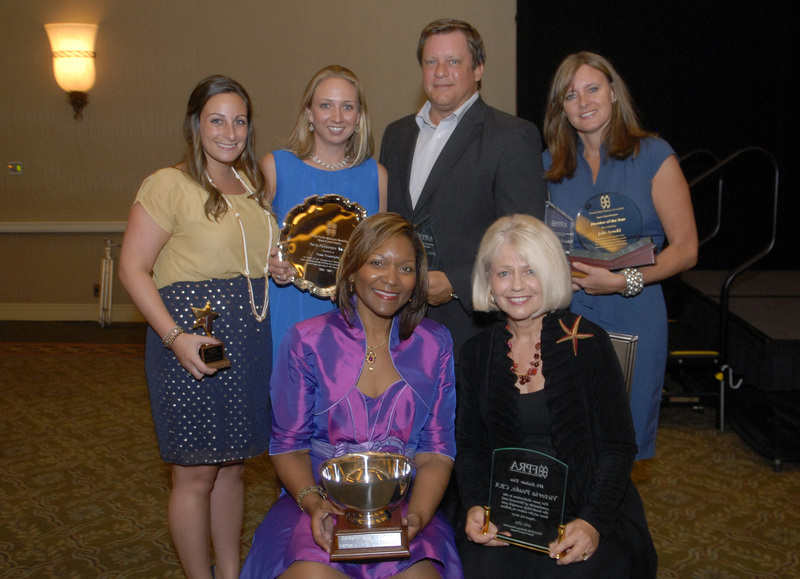 The FPRA Space Coast Chapter also presented its annual awards to the chapter members. Top Row (Left to Right): Rising Star Award Recipient Angelica DeLuccia, Doris Fleishman Award Recipient Tessa Friederichs, Excellence in Chapter Service Award Recipient Geo Ropert, APR, Member of the Year and President’s Award Recipient Julie Arnold, (Bottom Row, Left to Right) PR Professional of the Year Rosalind P. Harvey and Honorary Roastee of the Evening Victoria Peake. Angelica DeLuccia received the Rising Star award, which is given to a local practitioner who has just begun his or her career in public relations, but who has made significant contributions to the Space Coast Chapter. Geo Ropert, APR, received the Chapter Service award for his time contributions and outstanding effort as VP of Accreditations. Julie Arnold received the Member of the Year and President’s awards for service above and beyond the call of duty and taking on many roles contributing to the Chapter’s success. Tessa Friederichs received the Doris Fleishman award, for her consistent and tireless behind-the-scenes efforts.